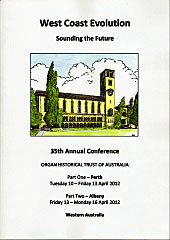 Each year the Organ Historical Trust of Australia organises a conference lasting about a week in one of the states of Australia. Conferences have also been held on both islands of New Zealand. 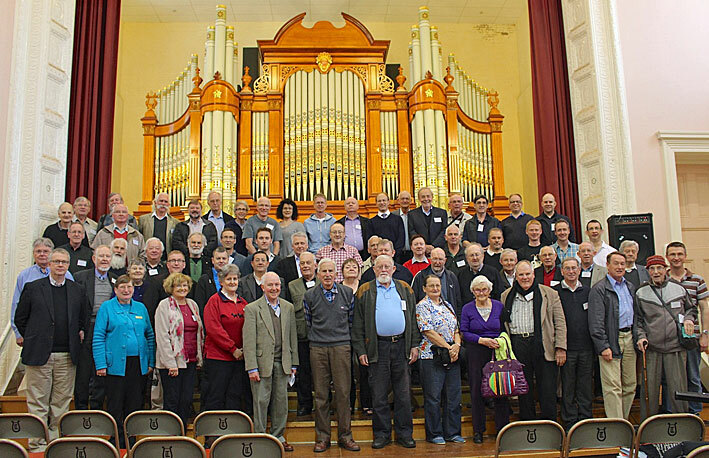 These conferences bring organists and those interested in the instrument together from all over Australia, as well as New Zealand, the UK, the USA, Asia and Europe. Often, an international authority on the history and restoration of historic organs attends as a key-note speaker. Past guests have included Uwe Pape (Germany), Barbara Owen (USA) and Stephen Bicknell (UK). Opportunities are provided for recitals on historic and instruments. Members often have time to play and inspect the instruments for themselves and papers on the preservation of organs and other relevant topics are presented and later published in OHTA News. 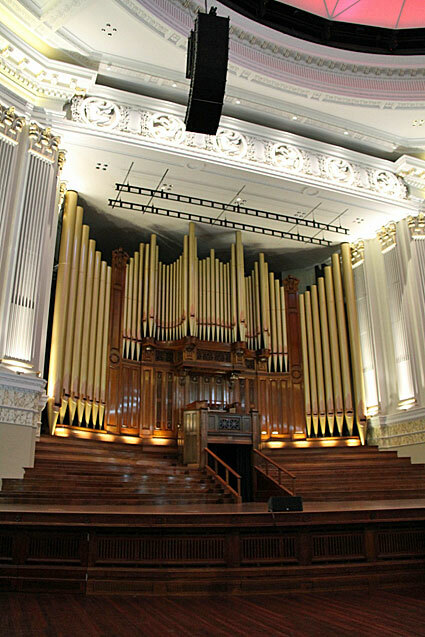 The Organ Historical Trust of Australia's 2017 conference will commemorate the 40th anniversary of the foundation of the organisation in May 1977 as well as focussing upon the work of 19th century Melbourne organbuilder Alfred Fuller. There will be papers and panel discussions associated with these two themes, details of which are given below, together with a number of recitals and demonstrations. The conference will also include visits to significant instruments, not only by Alfred Fuller, but also by Alfred Crook, George Fincham, Balbiani, Harrison & Harrison, Samuel Joscelyne, Henry Willis & Sons, J.W. Wolff, Hill, Norman & Beard, Halmshaw and Hamlin & Son. The programme will include a number of organ recitals and a visit to the Grainger Museum. A block booking for OHTA has been made at the Ibis Melbourne Hotel and Apartments, 15-21 Therry Street, Melbourne, but you must contact the hotel directly before 30 June 2017 to ensure a preferential rate, quoting code: 'OHTA40'. Room only cost per night is $125.00 (max 2 per room). Contact Andrew Singer (Reservations Manager), email H1564-RE2@accor.com or telephone 03 9666 0000. Breakfast can be reserved at a reduced rate ($16.00 per day) at the time of booking. Accommodation for one night only (Friday 29 September) has been reserved at the RACV Goldfields Resort, Creswick, north of Ballarat, and is included in the conference registration. As the end of the week will be the football Grand Final Weekend, it is suggested that your accommodation and transport to Melbourne be given high priority. The conference will start on Monday 25 September, with registration from 9.00 am at St Paul's Cathedral. It will conclude in Ballarat on Saturday 30 September at 12.15 pm and after a lunch break the coach will drop participants at Melbourne airport by 3.00 pm and then central Melbourne. As this will be the AFL Grand Final weekend, it is suggested that accommodation in Melbourne and interstate transport be booked early. The conference will examine in some detail what OHTA has achieved through the 40 years of its existence. The foundation of OHTA in 1977 will be discussed and then specific aspects of its achievements will be examined, including the Stiller documentations, OHTA News, the website, conferences, preservation standards, tax deductible appeals, significant restorations and losses, and future directions, such as the setting up of an OHTA foundation. 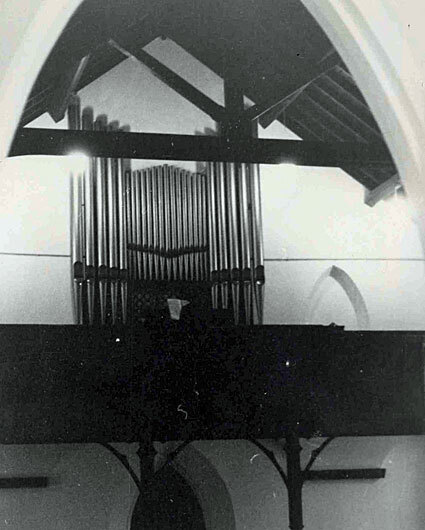 The conference will focus upon the work of Melbourne organbuilder Alfred Fuller, a number of whose instruments have been successfully restored and relocated. 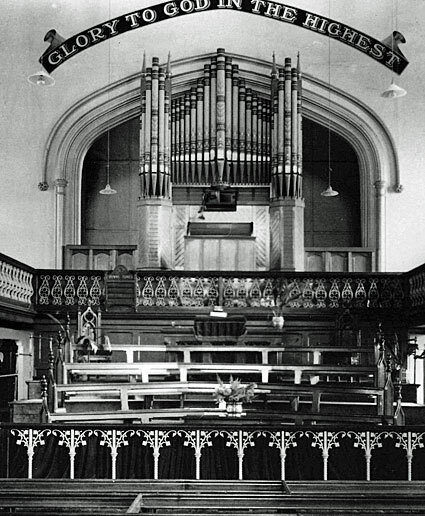 Fuller was born in Kelvedon, Essex in 1845 and worked with London organbuilder G.M. Holdich and gained further experience in North America before his arrival in Melbourne in 1871. Between 1880 and 1900 he built more than 25 new organs, distinctive on account of their excellence of workmanship, design and choice of materials. Fuller retired from organbuilding and moved into real estate and died a very wealthy man in 1923. Sadly, a number of his instruments have either been destroyed or rebuilt beyond recognition. The 2016 OHTA Conference will be held in the South Island of New Zealand. It will start in Christchurch on Monday 26 September and end in the Dunedin Town Hall on Sunday 2 October. A distinctive part of this conference will be learning about the greatest destruction of organs in Australasia (the 2010/11 Canterbury earthquakes), seeing the earthquake impact on central Christchurch, and acknowledging achievements of the rebuild. In addition to visits to many organs of historic interest, each day includes a contrasting activity such as lunch in Ferrymead Heritage Park (Edwardian township), visiting New Zealand's first musical farm (cow bells, boomwhammers, musical windmill, ...), and visiting the South Island Organ Company factory near Timaru. The cost is somewhat higher than previous conferences, because of the inclusion of 7 nights' accommodation and substantial coach travel. There are discounts for members and "early bird" registrations. Please send enquiries to Charles Sullivan (ohta2016nz@gmail.com). Vous pouvez soumettre questions en français à ohta2016nz@gmail.com. 1. Typing into that brochure, saving the file, and emailing it to ohta2016nz@gmail.com. 2. Paying by direct bank transfer (the first payment option in the brochure). Even if you need to post a cheque or pay by credit card, we would still appreciate it if you would try typing the other details into the brochure (credit card numbers are excluded from the typing for security reasons) and emailing the brochure in addition to sending anything that you need to post. Typing saves us time and eliminates errors from misreading handwriting. If you have difficulty typing into the form (e.g. old software may not let you do that), then of course we're still happy to receive your form scanned or posted. Please click here for travel tips	to	and	from	NZ. 10:15 Knox Presbyterian. Registration + morning tea. Video display of earthquake impact on organs. 10:55 Lecture/presentation by John Dodgshun: Earthquake-related organ losses with focus on St Mary's Merivale story -- Hill, Norman & Beard 1926/1938, reb. 1968 Strachan, 3/49. 12:00 Organ recital by Andrew Blackburn. 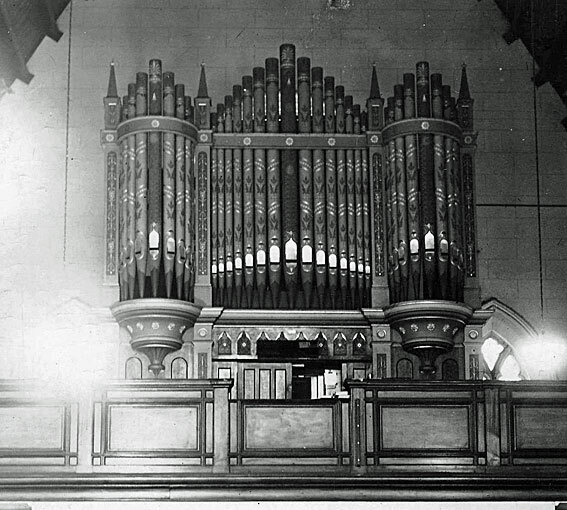 Organ: Jenkins 1903; reb. 1913 Pearce inc parts from Nicholson & Lord; reb. Brett 19?? ; rest. 1987 SIOC; rest. & enlarged 2014 SIOC; 3/30. 14:45 Walking Tour (weather permitting). The quakes: destruction and rebuild (getting to grips with the impact first-hand). Taxi-van alternative to Quake City Exhibition for those not wanting to walk. 17:00 St Michael and All Angels Anglican. Bevington 1872; reb. 1896 F&H; reb. 1944 Lawton & Osborne; reb. 1951 HN&B; reb. 1971 Strachan; O/H 1978; 2001 SIOC; 2014 SIOC; 3/37. 18:00 Evening meal in cafes etc nearby (DIY; suggestions on map in booklet). 19:30 St Mary's Pro-Cathedral. Cathedral of the Blessed Sacrament Choir concert with organs, harpsichord, piano, violin. En route, drive by sites of St Luke's, Oxford Terrace Baptist, Octagon/Trinity Congregational, Transitional Cathedral/St John's Latimer Square (the 'cardboard cathedral'), St Paul's Trinity Pacific, Cathedral of Blessed Sacrament (Petre architect). 12:15 Ferrymead Heritage Park. Edwardian township complete with picture theatre, school house, church, bakery, jail and railway station, steam train, trams. Home to 20 heritage societies. 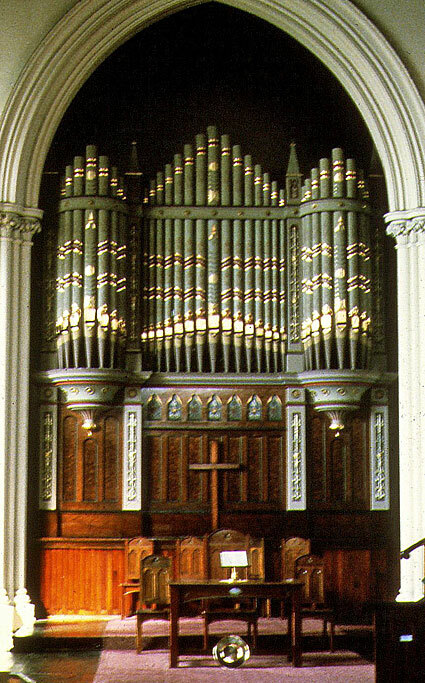 Organ: Sandford 1887-8, rem. 2007 from Hospital Sunnyside (Hillmorton); 1/4. Catered lunch. 20:00 OHTA Council meeting, Webb Room at Pavilions Hotel. 19:00 Dinner at Landing Services Building (heritage building from 1871). Walk from hotel (3mins). 10:45 St. Patrick's Basilica Waimate. Hobday 1918, rest. 1996 SIOC; 2/19. Francis Petre building. 15:00 South Island Organ Company factory. Diverse activities. 19:30 Concert at Sacred Heart Basilica. A. A. Hobday 1912, pipes from 1848 Gray & Davison, rest. 1986 SIOC. 2/26. 09:45 Waitaki Boys High School (Hall of Memories), Oamaru. Lawton & Osborne 1932, rest. 1996 SIOC. 2/24. 11:00 St. Patrick's Basilica, Oamaru. Positive Organ Co; 1/7. Hobday 1899, reb. Matla 1956, rem. from Masterton Anglican St Matthew's, 2/19. Petre building. 12:00 DIY lunch and walk around Oamaru Victorian Precinct (attractive whitestone buildings). 13:45 St. Andrew's Maheno. Brett 1938; 1/6. 15:15 Palmerston. Catered afternoon tea at Station Café. 16:50 Iona Presbyterian, Port Chalmers: Hill c.1916, inst. 1926, rest. 1998 SIOC. 2/13. 19:00 Arrive Leviathan Hotel. DIY meals nearby (map in booklet has pointers to areas nearby with plenty of cafes and restaurants). 8:30	Load buses (minivan first). Split into two streams because of limit on numbers at Burchell home. ●	9:05	Burchell residence – Telford 1864 2/19. Positive Organ Company 1 / 4 (from Broad Bay church). ●	10:05	St David's Presbyterian, North East Valley: Nicholson & Lord / Pearce 1913-14. 2/15. ●	8:55 St David's Presbyterian, North East Valley: Nicholson & Lord / Pearce 1913-14. 2/15. ●	10:45	Bus departs (picking up others from St David's en route). 11:20	St Matthew's Anglican, Dunedin: Bevington 1879, 1895 Jenkins added prep. Trumpet rank, enl.1908 Norman & Beard, reb. SIOC 1969. 3/26. 12:30	Lunch in Te Toitu/Otago Settlers Museum Museum (Auditorium). 14:05 Museum visit. Barrel organ on display (but will not be played/demonstrated) Bryceson c.1850, rem. 1864 from Dunedin Anglican St Paul's Cathedral. Barrel organ with 3 barrels each with ten tunes. 8,8,4. In storage (will not be seen): John Taylor 1885. 1 /4. 14:45	Afternoon tea in the Museum. 15:10	Depart museum on foot (unless raining). 10 min walk + viewing First Church en route. 15:30	Cathedral Church of St Paul the Apostle (Anglican): Willis 1919, reb. SIOC 1973. 4/61. Also Croft, rem 2008 Wellington Lutheran St Paul's. 1/5. 16:45	Catholic St Joseph's Cathedral. Fincham 1866, reb. and enl. SIOC 1976. 3/35. Petre building with St Dominic's Priory nearby too. ●	Choral Services at Cathedral Church of St Paul the Apostle (Anglican) 10am; Knox Church Presbyterian 10 am and St Joseph's Cathedral (Catholic) 10 am. 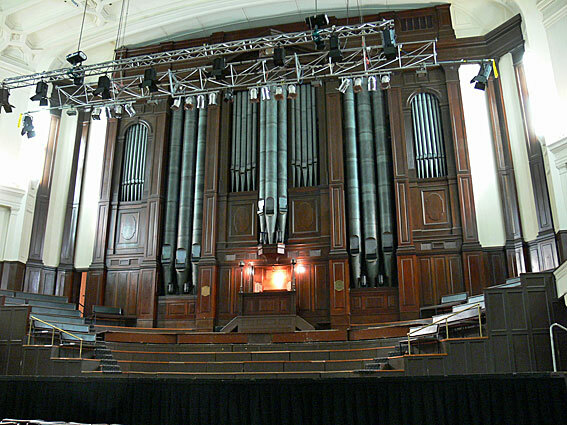 14:00 Town Hall concert by David Burchell, Dunedin City Organist. 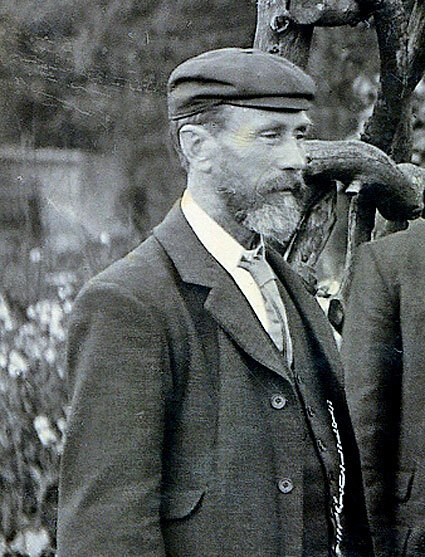 Hill, Norman & Beard 1919, enl. 1923 HN&B, enl. 1929 HN&B, rest. 1995 SIOC. 4/61. 16:00	Bus departs for Christchurch. (Others will choose to stay in Dunedin and fly from there on Monday; or to travel further in Otago/Southland). The 2015 OHTA Conference will be held in country New South Wales, commencing in Newcastle on Sunday 27 September and finishing there on the afternoon of Saturday 3 October. It is proposed that a coach will leave central Sydney on the afternoon of 27 September – interstate/overseas participants will therefore be able to fly in and out of Sydney. It is possible to fly directly to Newcastle (Williamtown), but as there are only a few direct flights daily from Brisbane, Melbourne, Sydney and some other regional centres, intending participants are advised to book early. Newcastle airport is some 30km from the centre of Newcastle, and is accessible by taxi or bus. If necessary, the conference coach will take participants to Newcastle airport at the conclusion of the conference and then return to Sydney. The conference will take the form of a tour north along the mid-north coast of New South Wales as far as Bellingen, then inland to Armidale and returning to Newcastle. 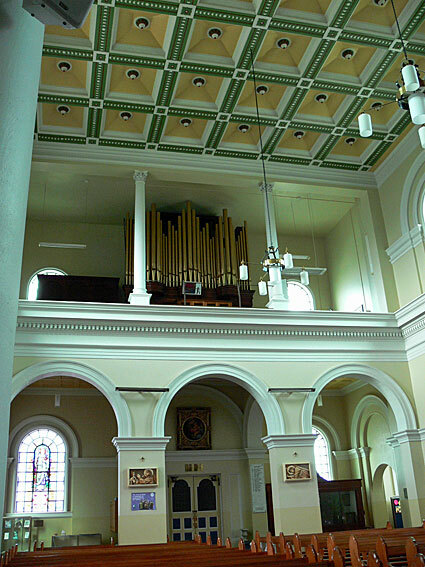 About 21 organs will be heard during the tour: the area contains representative samples of the work of English builders Hunter, Nicholson, Walker and Willis, an American Estey pipe organ and Australian organs by Davidson, Dodd, Fincham, Griffin & Leggo, and Whitehouse. There will be minimal overlap with organs visited during the 2005 conference, which focused on instruments of the lower Hunter Region. A small number of lectures and recitals will be given and there will be a short festival of Wesleyan hymnody to celebrate the 200th anniversary of the foundation of Methodism in New South Wales. The cost of registration will be somewhat higher than previous conferences, owing to the inclusion of six nights' accommodation in the fee. There will be discounts for members and "early bird" registrations. Enquiries can be directed to Kelvin Hastie (khas@bigpond.com). Please click here to download the Conference Brochure. Please click here for further details of organs to be visited and daily schedule. 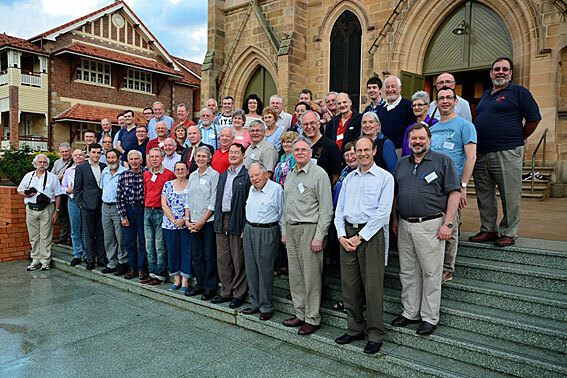 The 37th annual conference of the Organ Historical Trust of Australia was held in Queensland from 22-27 September 2014. 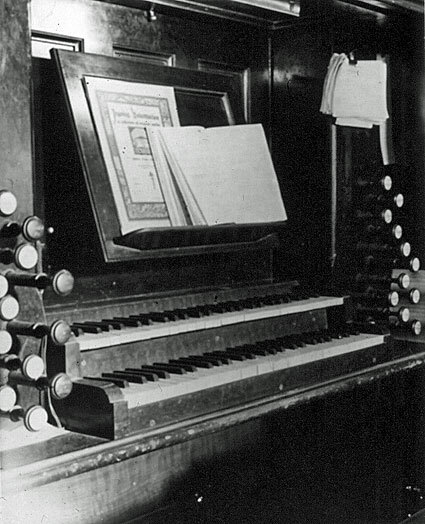 There was a number of visits to many significant organs, such as the Norman & Beard instrument at St John's Cathedral, which has received a major tonal revision since our last visit, and to a number of organs by the local firm of Whitehouse Bros. together with others by Pierce Pipe Organs, Knud Smenge, Roger Pogson, J.W. Walker & Sons and Kenneth Tickell. Papers were also delivered that were relevant to the themes of the conference. Please click here to see the full details. Full details and updated information is available on this page. Transport on the tram within the CBD is free but there is a cost associated with travel to Glenelg and North Adelaide. Buses are scheduled for every 15 minutes to North Adelaide but route numbers need to be carefully selected. A shared taxi from the South Terrace hotels to St Peter's Cathedral might be an option. 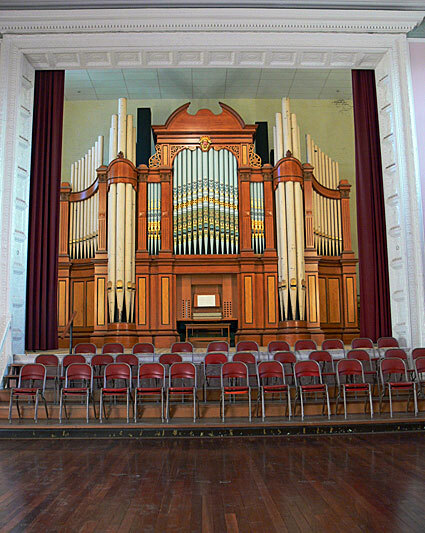 OHTA's 2013 conference will focus upon the restored 1875 Hill & Son grand organ, located at the Barossa Regional Gallery, Tanunda, a thriving historic town located in the renowned Barossa Valley, famous for its wines. It is anticipated that this organ will be completed to a state of full playability in time for the conference and it will be heard in several recitals, discussed in relevant papers, and there will be opportunities for participants to play the instrument. We will visit a number of significant organs in Adelaide, before moving to the Barossa Valley via Moonta, and there will be day excursions to several instruments and historic sites and opportunities for wine tastings. OHTA's international guest for the conference will be Dr William McVicker, who is a highly regarded organist, teacher and authority on the organ, based in the United Kingdom. He is curator of the organs at the Royal Festival Hall and Reading Town Hall and has made a significant contribution to the promotion and development of these instruments. His skills as an organ consultant have also been widely sought. The Organ Historical trust of Australia 34th annual conference was held in Tasmania from Tuesday 26 April (immediately after Easter 2011 and Anzac Day) and concluded in Launceston on Sunday 1 May. The conference included visits to organs, mostly of historic significance, recitals, lectures and visits to places and buildings of scenic or architectural interest. Please download the Conference Brochure by clicking here. Please click here to purchase a copy of the Conference Book. 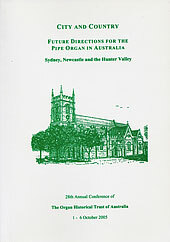 With the theme “A Diverse Heritage: organs in historic urban and rural settings in New South Wales”, the 2010 OHTA conference took place in Sydney and the Central West of NSW, 5 - 11 April 2010. The post-Easter time was designed to attract students to the conference, for whom attendance at other times has proven difficult in recent years, owing to changes in the University calendar. The conference featured about 29 organs, including instruments by Hill & Son, Forster & Andrews, Fincham, Puget, Pogson, Norman & Beard, Leggo, Walker, Davidson, Hunter, Brindley & Foster, Richardson and Dodd. The 32nd OHTA Annual Conference was held in South Australia commencing Saturday 3 October and continuing through the following week. Sights, sounds and tastes were explored as we visited Adelaide and the Barossa Region. A rich and diverse palate of organ and German culture was a feature. 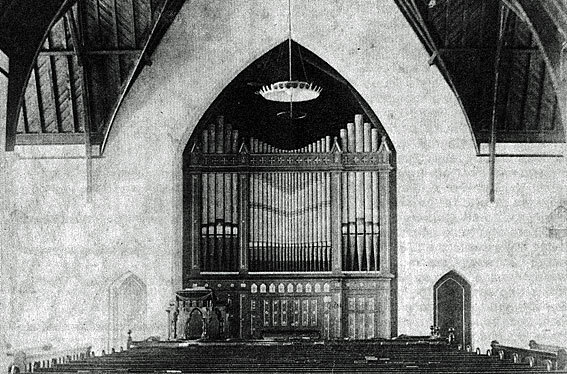 The 1875 Hill & Son Grand Organ and the organs of German immigrant Daniel Lemke were focal points. Instruments by Gebrüder Walter, Löhrmann, Laukhuff, Krüger and J.E. Dodd were also visited. A country tour to the historic copper mine of Burra was incorporated. A downloadable brochure with booking arrangements is available here. 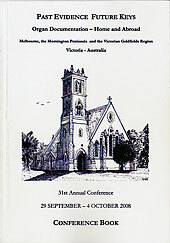 The 2008 OHTA annual conference took place in Victoria, based in Melbourne and Bendigo, in the Victorian countryside. The theme of the conference was the technical documentation of significant pipe organs and how this information can be used to facilitate accurate restoration and reconstruction. The keynote speaker was Paul Peeters, from Gothenburg, Sweden, the president of the International Association for Organ Documentation. A number of recitals took place, together with visits to notable organs by the local builders Anderson, Fincham, Fuller, Hill, Norman & Beard, Lemke and Stone, and the overseas builders Bishop, Hamlin, Hill, Merklin, Randebrock, Willis, Wurlitzer and anon. Copies of the 148-page conference book are available at a cost of $17.50 (inclusive of postage and packing within Australia) from OHTA, GPO Box 676, Sydney, NSW 2001; cheques payable to Organ Historical Trust of Australia. The book includes historical and technical details of the organs visited, many accompanied by line drawings from Graeme Rushworth, together with the programmes of the various recitals and events. A mine of information on NSW organs. Please email Dr Kelvin Hastie for more details. Copies of the 174-page conference book are available at a cost of $20.00 (inclusive of postage and packing within Australia) from OHTA, GPO Box 676, Sydney, NSW 2001; cheques payable to Organ Historical Trust of Australia. The book includes historical and technical details of the organs visited, many accompanied by line drawings from Graeme Rushworth, together with the programmes of the various recitals and events. A mine of information on Queensland organs. Copies of the 197 page 2008 conference book are available from PO Box 200 Camberwell Victoria 3124 at a cost of $25.00 inclusive of postage throughout Australia. Overseas rates upon application. 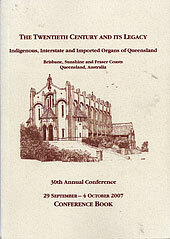 Please click here to purchase a copy of the 2011 Tasmanian Conference Book.